Last summer my triplets were only a few months old. My husband had left for work one evening when a terrible thunderstorm set in directly over our house. The electricity did the familiar flicker-flicker and then went out. And it stayed out. So there I was, with four month old triplets and a preschooler, and no power. The power was off for several hours, but I actually weathered this hiccup better than I thought that I would. Here we are, in the midst of thunderstorm season once again. The kids are older now, and I think that the triplets would do okay with no electricity, but I can already hear my daughter’s complaints of “I’m bored!” and “What are we going to do?”. I’m taking initiative being proactive this year. I’ve created her a special Creative Preparedness Bag specifically for bad weather situations where the power goes out. The bag contains special items just for her that are also boredom busters. This bag can be customized for each child, but I’ve compiled a list of 6 Items to Include in a Kid’s Creative Preparedness Bag, including a few electronics powered by Duracell. 1. 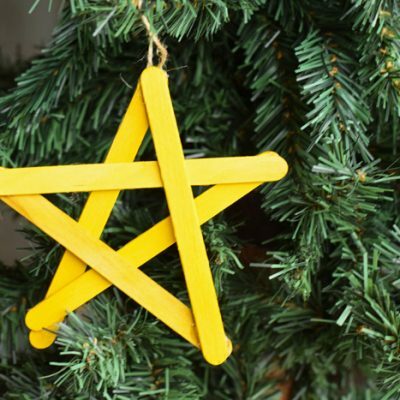 A fun, glow-in-the-dark, creative toy that is “new” to the kiddos. In my daughter’s bag, I’ve included the Crayola Dry Erase Light Up Board. This way, she can play with it even if there are no lights. In actuality, it’s more fun if the power is off. I don’t let her play with it unless there is no electricity. That way the toy is “new” every time that she uses it. The Crayola Dry Erase Light Up Board only takes four AA batteries, so I’ve stocked mine with brand new Duracell batteries to make sure that the toy is ready to go during the next power outage! 2. Flashlights. Flashlights serve double duty- safety and fun! 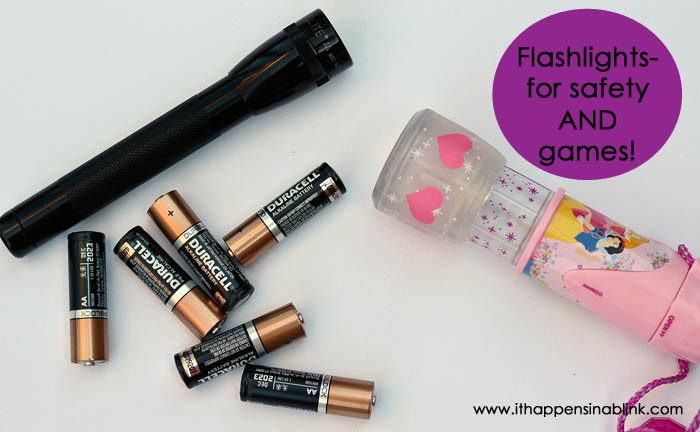 Kids need flashlights when the power goes out, too, so letting them pick out a flashlight especially for them can eliminate fears when there is no electricity. Of course, a good game of flashlight tag never hurt anybody, either! Don’t know how to play flashlight tag? One player has the flashlight. The other players hide, and the flashlight player tries to find the others. Once that player shines a flashlight on a participant, that person becomes “it” and has to look for the others with the flashlight while the first person with the flashlight hides. Sounds like fun, right? 3. Extra batteries. Electronic products mean batteries. A parent’s worst nightmare during a power outage can be an electronic game or flashlight that doesn’t work anymore. 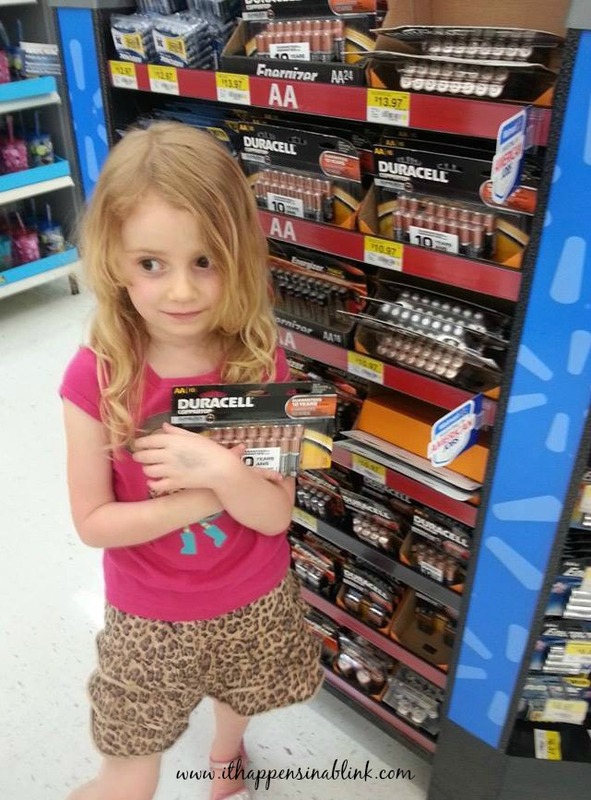 Depending on the age of the child, you may want to keep the batteries in your own bag. 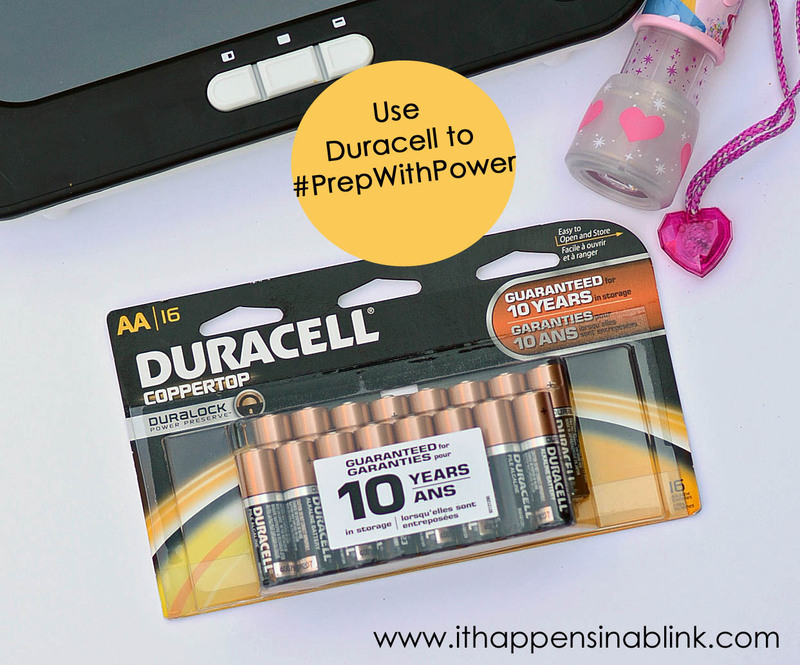 I stay supplied with Duracell Coppertop AA batteries because those are the ones that the items in our bags use the most. I have found that buying batteries in bulk at Walmart is the best value (and these handy coupons always help!). Our local Walmart has a battery display up front near the registers. My daughter helped me pick up another pack last week. She’s eying the candy in this photo while we shop for batteries. 4. Creative art items. 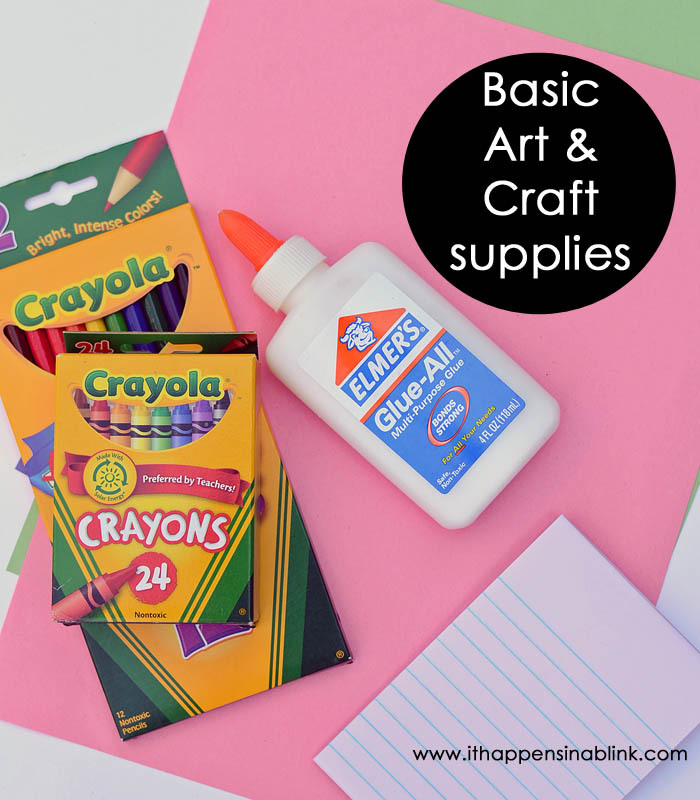 Crayons, paper, glue, and colored pencils go a long way during a storm. While the above items 1-3 are awesome for night creative play, these items are for great for during the day. 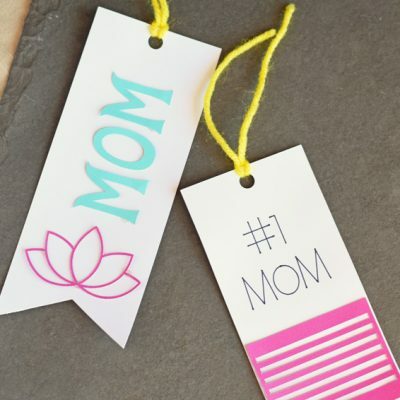 Chose lightweight items that can be cut, colored, and folded into different creative shapes and pictures. 5. Snacks. Moms know that we don’t go anywhere or do anything without snacks. My kids eat all the time, and a storm isn’t going to turn off their appetite. I pack bottled water and snacks, and then check the expiration date on the snacks every few months. 6. Imagination. The secret to keeping kids occupied during storms and power outages is to supply them with items that encourage their imagination. When packing the above items, chose items that have defined shapes so that they can double as stencils. 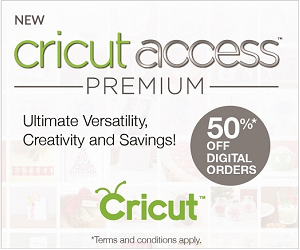 These “stencils” can be used with the Crayola Dry Erase Light Up Board or for plain ol’ paper! 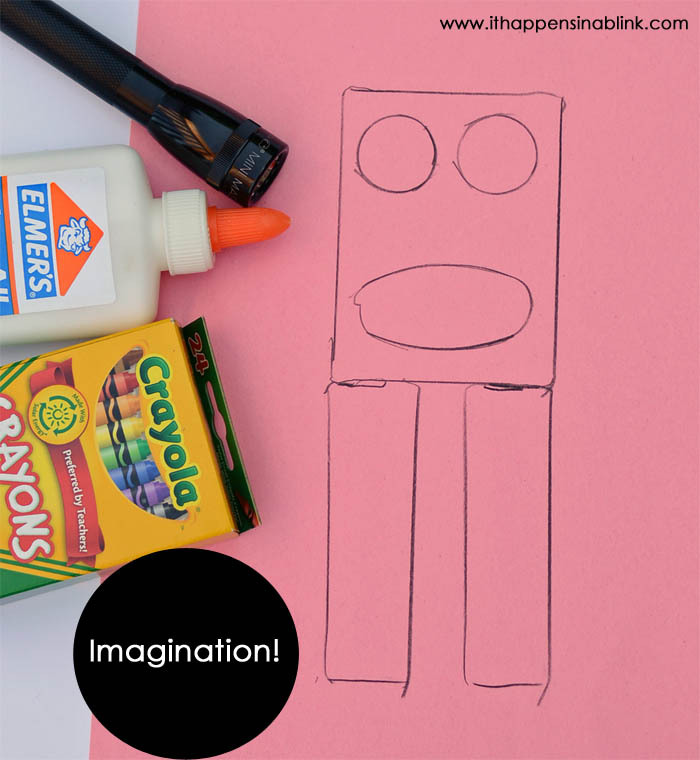 The simple robot below was stenciled using a box of crayons, a glue container, and a flashlight. Summer storms and power outages can be scary for kids. But once the fear has subsided, often the boredoom hits! 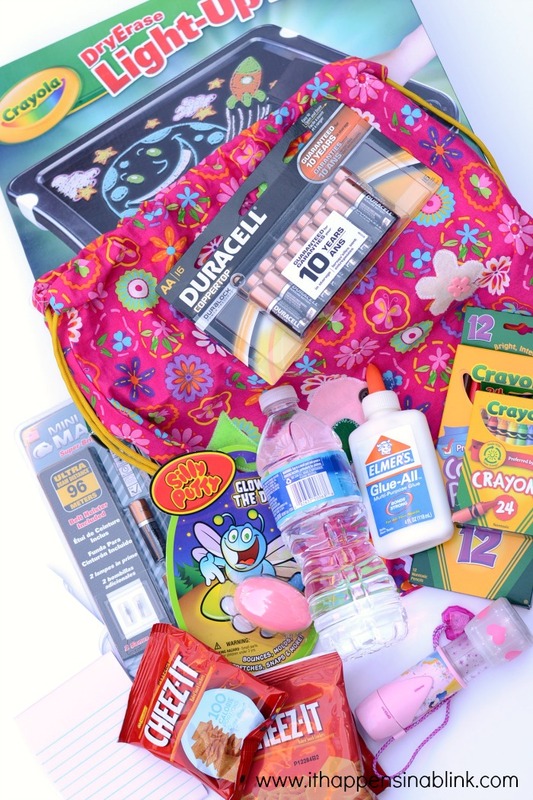 Crush anxiety and boredoom with a Kid’s Creative Preparedness Bag tailored for your own child! It is definitley important to keep them busy when the power goes out!! What a great way to have the kids prepared for emergencies. Pinning! This is a great idea. We entertain out kids with playing outside and electronics so often that you kind of have to dig to find activities without electricity. Smart idea to keep it ready! This is awesome! What a great idea and a necessary one at that. Cheers! Great ideas! I love to color to this day, so relaxing. I need to pick up batteries, so thanks for the reminder. Great ideas, Melanie! In my case, the hardest part for me would be to remember where I put the emergency bag! My kids would love this. Great ideas! I will have to keep these in mind for our long road trip later this summer…thanks! 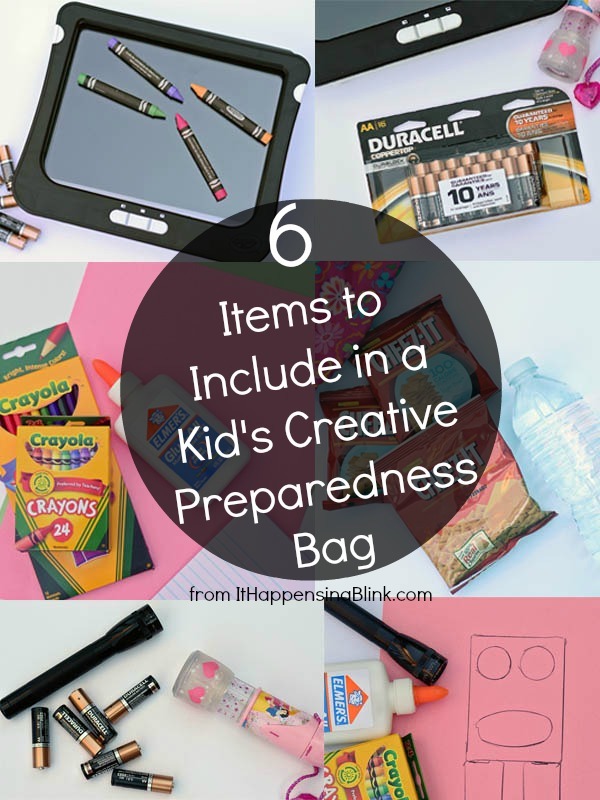 I absolutely LOVE the idea of a creativity preparedness bag! My kids all need one of these–even the teenager! Great ideas! What a fun bag! I really want to look into that light up board! Those would definitely keep them busy for a while.. I know the drawing would have my kids in a zone for a long time. It’s so important to keep kids busy! All these actives are sure to keep kids entertained and happy. This looks like a great bag, I’d need to get my daughter one like this. This is such a great idea to distract kiddos from scary weather or situations!! Putting one together soon!! Great idea to have a kid’s creative preparedness bag. I love all that you have included! 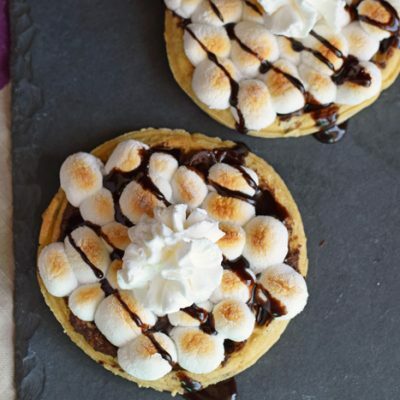 Parents will REALLY Love having this if or when a storm hits and the power goes out…this could change a frightening time into a fun campout party! SUCH a great idea for all the stormy weather we are having in Illinois. 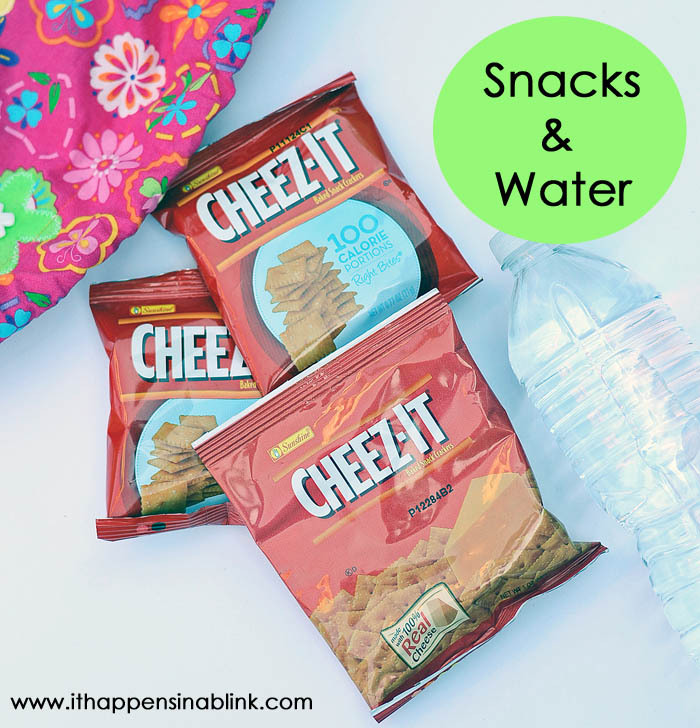 Great items for a prep bag! 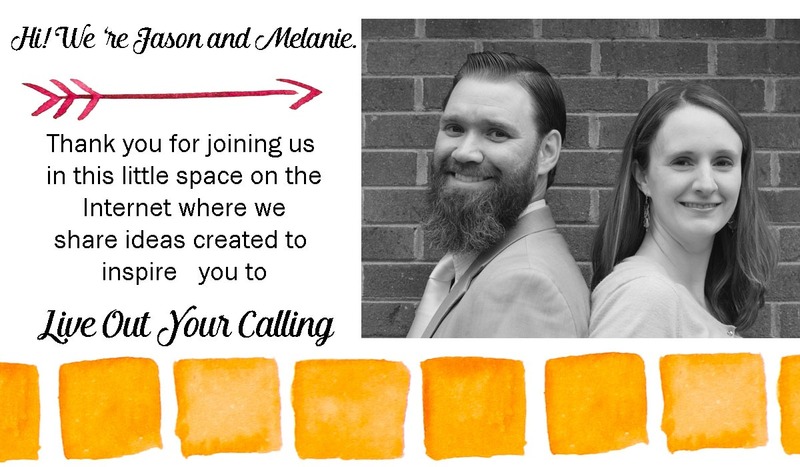 I haven’t seen the light up dry-erase boards, I’ll have to look for them! Brilliant idea! It’s an important reminder for everyone (even people like me with no kids) to have a preparedness bag packed for emergency situations! I actually want that dry erase board! And great idea to keep it as a special toy. Think I will steal that idea. Oh, yes! Snacks, lots of snacks and a cool new toy! Hope you don’t have to go through that alone, but being prepared just in case is so important! This is such a great idea. We are never prepared for summer storms. This is a really great idea and could be useful in a number of situations! 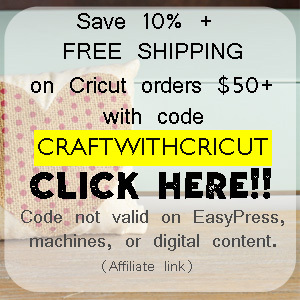 I love all the great craft ideas and then the cheese-its!! Haha perfect! I liked your list, even in some kind of emergencies, the kids are well prepared. Adding a Card with Parents name and contact details would be great! This is a great idea! Even with electricity my kids keep saying they are bored. LOL. Anyway, I think it’s so adorable that you have triplets. That’s fantastic, Melanie! 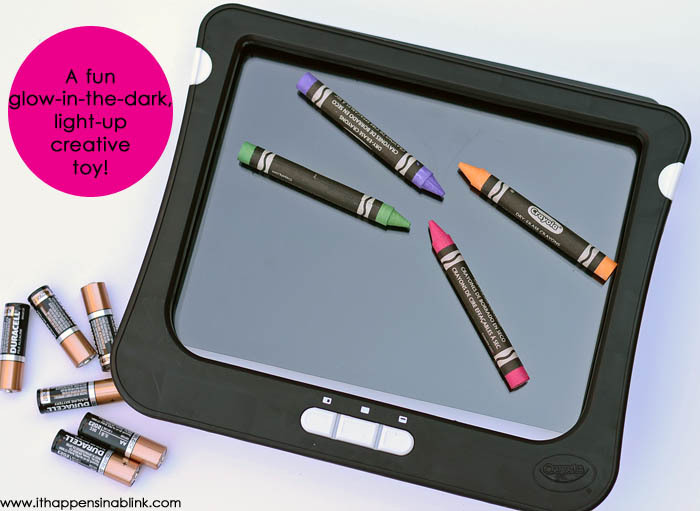 I love the idea of having a bag ready for the kidlets – and that light up board looks awesome! So smart to always have batteries around!